Clintonville, WI list of housing resources we have uncovered: Homeless Shelters, Supportive Housing, Halfway Housing, Transitional Housing, Day Shelters, Low Income Housing, Residential Alcohol and Drug Treatment Centers. Shelter Listings is dedicated to serving the homeless and low-income. We have listed out the shelters and low cost housing services we have in Clintonville, WI below. This list has homeless shelters, halfway houses, affordable housing, etc. The database consists of over 3,000 listings and includes emergency shelters, homeless shelters, day shelters, transitional housing, shared housing, residential drug alcohol rehabilitation programs and permanent affordable housing. Clintonville is in Waupaca County, WI. Search listings by Waupaca County. We found very few listings in Clintonville. In that case, here are some local areas that do have shelters or supportive housing of some sort. We provide the full addresses and distince from the center of Clintonville. Day Shelters supplement homeless and low-income people when the shelter their staying in only offers shelter on an overnight basis. Case management is often provided and sometimes there are laundry and shower facilities. Meals and basic hygiene may also be offered. Almost all day shelters provide their services free of charge. 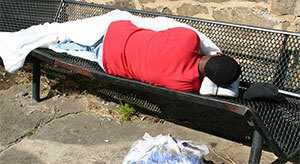 Any emergency or homeless shelter that allows clients to stay during the day is also classified under this category. Emergency Homeless Shelters both provide short term relief for the homeless & low-income. Usually there is a maximum stay of 3 months or less. Many of these shelters ask their clients to leave during the day. Meals and other supportive services are often offered. 3 times out of 5 these shelters offer their services free of charge. Halfway Housing helps transition individuals and families from shelters or homelessness to permanent housing. Length of stay is usually anywhere from 6 months to 2 years. Residents are often required to pay at least 30% of their income toward program fees. Sometimes the money they pay in fees is returned to them when they leave. Any emergency or homeless shelter that allows their clients to stay more then 6 months is also classified under this category. Permanent Affordable Housing is a long-term solution for housing. Residents are often allowed to stay as long as they remain in the low-income bracket but is sometimes limited 3 - 5 years. Residents pay no more than 30% of their income toward rent. Emergency shelters, homeless shelters and transitional housing programs that allow their clients to stay without a maximum stay is also classified under this category. Drug And Alcohol Rehab programs are intended to treat alcohol and/or drug dependency. The cost of participating in one of these programs and the method of treatment range significantly. The database operated on this website only includes residential rehab programs (not outpatient programs). We also provide Access to Recovery (ATR) Grant programs for substance abuse treatment. Supportive Housing Programs that provide an alternative living arrangement for individuals who, because of age, disability, substance abuse, mental illness, chronic homelessness or other circumstances, are unable to live independently without care, supervision and/or support to help them in the activities of daily living; or who need access to case management, housing support, vocational, employment and other services to transition to independent living. Shared Housing Programs helps bring low income persons together and helps prevent homelessness by providing affordable housing options. This service is good for families, disabled persons, and others wanted more companionship. ShelterListings.org finds these shared housing locations and lists them throughout our website. Rooming House or Boarding House A rooming house is a building in which renters occupy single rooms and share kitchens, bathrooms, and common areas. The location may be a converted single family home, a converted hotel, or a purpose built structure. Rooming houses are low cost housing and may have as few as three rooms for rent, or more than a hundred. The same goes for boarding houses. We list these types of residences throughout ShelterListings.org. Transitional housing is affordable low cost supportive housing designed to provide housing and appropriate support services to persons who are homeless or who are close to homelessness. The transition is to help them be more self sufficient to move toward independent living on their own. Services provided at transitional housing facilities varies from substance abuse treatment, to psychological assistanc, job training, domestic violence assistance, etc. The assistance provided varies, but it is generally affordable and low cost housing. Read the descriptions of each of the transitional living locations for more detailed information. Need Help Paying Your Bills? Need a rehab or sober living facility? To help the needy find shelter and assistance. This nation is going through tough times and providing a helping hand can help make the world a better place.